Offering friendly, beginner running and walking programs for women who are experiencing mild to moderate depression and/or anxiety, Up and Running Guelph promotes both mental and physical health. “Kelly has been an integral part of the development of Up and Running Guelph, a leader in the delivery of our programs, and a key element of our success” shares Shirley Hunt, Co-founder, Executive Director, Mentor. “Our programs harness the power of peer support and outdoor activity to support women in managing their mental health. 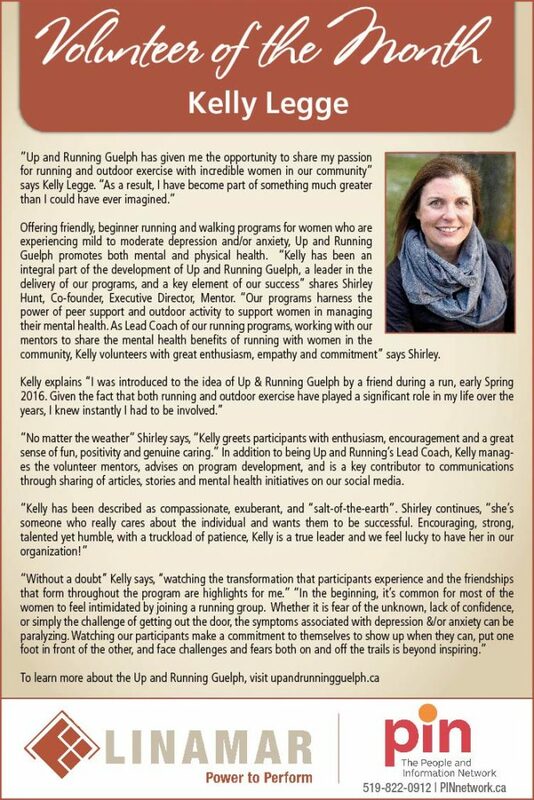 As Lead Coach of our running programs, working with our mentors to share the mental health benefits of running with women in the community, Kelly volunteers with great enthusiasm, empathy and commitment” says Shirley. “No matter the weather” Shirley says, “Kelly greets participants with enthusiasm, encouragement and a great sense of fun, positivity and genuine caring.” In addition to being Up and Running’s Lead Coach, Kelly manages the volunteer mentors, advises on program development, and is a key contributor to communications through sharing of articles, stories and mental health initiatives on our social media.